Auditions are by REGISTRATION only. Please contact info@LONJ.org to register for one of the above dates, and include your head-shot, resume and home town. 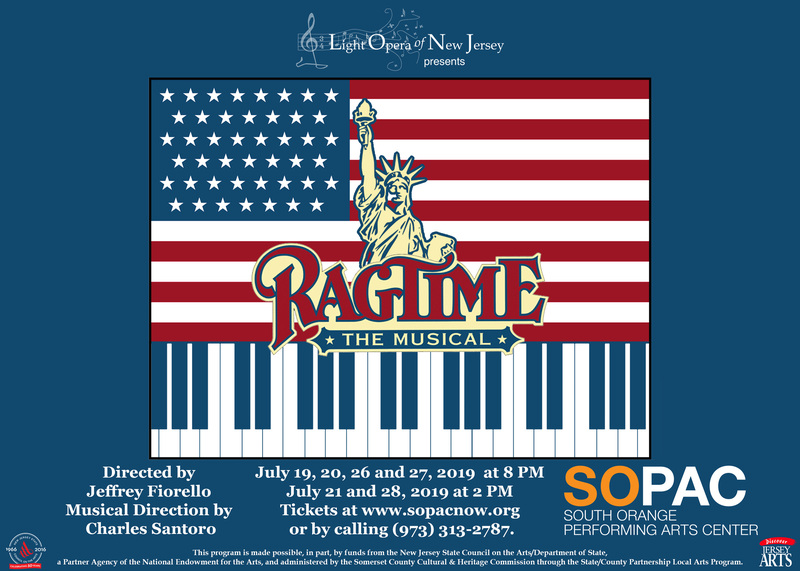 Auditions, rehearsals and performances will be held at South Orange Performing Arts Center (SOPAC), SOPAC Way, South Orange, NJ 07079. Accompanist will be provided. Singers from New Jersey preferred. Children auditioning for the role of Little Boy/Edgar and Little Girl will be heard FIRST. They must arrive shortly before scheduled audition starting times in order to be heard. Booker T. Washington (Mid to late 40’s, Baritone): A Black educator and Civil Rights Activist who preaches for equality and justice for all people. Coalhouse Walker Jr. (28 – 38, Powerful Rich Baritone. Low Ab to High A): A charismatic Piano Player from Harlem. Later becomes militant and violent after his property is vandalized and his love (Sarah) is murdered. He struggles with injustice and the idea of the American Dream. Emma Goldman (35 – 45, Alto). Lithuanian Anarchist. She is the voice of the oppressed and disenfranchised, fighting for the rights of immigrants and the working class. Father (30 – 45, Baritone, Low A to High F). Genteel Victorian WASP husband and father. He is moral, but rigid, and clings to the status quo. Grandfather (55 – 70, Baritone). Mother’s aging WASP father. Crotchety / Complains Constantly. Henry Ford (35 – 45, Tenor). Inventor / Automaker who pioneered the modern assembly line. He is the symbol for Midwestern ingenuity – little educated, but plenty of gumption. Houdini (22 – 35, Baritone). The world’s greatest escape artist. He stands as a symbol of escape and freedom for immigrants, but he is plagued by self-doubt, as he knows all of his stunts are merely illusions. J.P. Morgan (55 – 70, Baritone). Elitist banking mogul and art collector. Imposing in stature and persona, he secretly believed he was reincarnated from the Egyptian Pharos. Little Boy (7 – 12, Tenor). Mother and Father’s Son. He is open-hearted and curious with inexplicable clairvoyance. Never passes judgment on others. Little Girl (8 – 12, Soprano). Tateh’s (Latvian-American Immigrant) daughter. A confused and vulnerable child in a brand-new home, she is guarded and shy. Mother (25 – 40, Mezzo with strong belt to low G). A Victorian Housewife and Mother. As events unfold, she begins to question everything and finds her inner strength and voice. Sarah (18 – 25, Mezzo with a strong mix). Innocent Girl from Harlem (passionate, naïve and idealistic), who wants nothing more than to marry Coalhouse and raise their son together. Sarah’s Friend (25 – 45, Gospel Voice). A friend of Sarah’s, in attendance at her funeral. Tateh (35 – 50, Tenor). Latvian Immigrant in search of the “American Dream” for his daughter. Through his creativity and resourcefulness he eventually becomes a successful entrepreneur. Willie Conklin (25 – 40, Bari-Tenor). Irish-American Fire Chief. He is a racist thug. Younger Brother (20 – 30, Bari-Tenor). Mother’s Younger Brother. Passionate, Romantic, Searching for a cause to give his life meaning (from Pursuing Evelyn Nesbitt to Anarchism). Charles Whitman (male) District Attorney. Admiral Perry (male) Explorer (to the North Pole). Kathleen (female) the Family’s Irish-born maid. Bridget (female) the Family’s impertinent new maid. Matthew Henson (male) famous explorer.